estate broker. They wanted to leave the sales and purchases of their inheritance to us. As for me, in my twenties, I used to work in a private company and engaged in store development and town development. 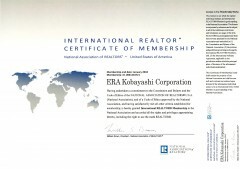 From those experiences, real estate business was familiar with me and therefore we started the real estate business. One of the advantages of construction companies founded by carpenters is that they are skilled at carpentry works. Before Meiji era, any buildings such as Shinto shrines, temples, castles and houses were designed and constructed by carpenters. 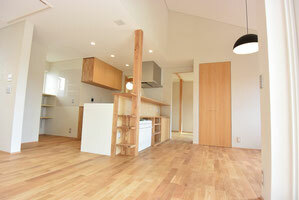 After Meiji era, however, design work and construction work were separated for the buildings except wooden ones. Consequently, now we can see wooden buildings designed and constructed by carpenters in the fields of free-standing houses, Buddhist temples and Shinto shrines. Carpenters engage in the construction work from start to finish; they lay the groundwork for other craftspeople first, and add the final touches by solid woods. It means that the construction companies founded by carpenters know the construction sites very well and are good at new construction and renovation. For that reason, carpenters were called master builders (shoku-gashira) in the wooden construction business. These days, though, there is the decreasing number of carpenters who can handle solid woods. On the other hand, the construction-related laws and regulations have been enhanced due to increasing natural disasters, and advance in science and technology has led to implementation of measures against earthquake-resistant system, barrier-free environment, and energy saving. Accordingly, new home designs are required and it is getting more essential for us to collaborate closely with our clients, designers, carpenters, craftspeople, and building materials suppliers. We, a construction companies founded by carpenters, will collaborate with construction business and real estate business and make efforts to provide our customers with appropriate information for their “living” environment, such as comfortable house building, renovation, looking for lands, real estate rentals and management, inheritance consulting services. Additionally, to support our clients as a housing consultant, we will focus on the strong collaboration with specialists from professional occupation and universities, and upgrade the consultation skills. from Japan and 34 other countries, makes full use of IT to develop their services globally. rentals, sale of real estate, house building and renovation. ERA member stores are also the members of LIXIL Group, which includes LIXIL Corporation that produces and sells house windows, interior and exterior building materials, tiles, exterior works, and water section equipment such as kitchen and bathroom. We, as one of the ERA member stores, offer various warranty services to our customers honestly for their risk-free real estate transaction. Home inspection, which is also called house diagnosis and building inspection, is the service that the specialists such as architects who specialize in house design and construction inspect the deterioration state of houses and objectively diagnose the presence of defects, damaged parts in need of repair, and the time for repair. We highly recommend that you should take the home inspection before you purchase or sell houses, and you can understand the condition of houses and make a reliable deal.